Our annual "Girls' Weekend" trip is not complete without a visit from Jerry at Healing Touch Massage. He truly does have a "healing touch" and adjusts his style to suit each person individually. The fact that he comes to us and can create a complete Spa environment in the house while the rest of us girls enjoy each other's company is ideal. We love his company and hate to see him leave even when he is all done. While we may rent a different house each time, the one constant is always going to be Jerry. It was an absolute blessing to have had Gerald visit on New Year's Day (2014) to give SIX massages. It made the most relaxing holiday staying in our cozy cabin while it snow stormed and taking turns having relaxing massages! We have all had massages at different spas and salons and unanimously decided Gerald's services were by far the best we'd ever experienced. He's warm, friendly, and a pleasure to talk to! We were grateful that he was able to travel to us and we didn't sacrifice any part of the experience of not being in a salon. He brought a professional massage table, aroma therapy and music. The environment was set perfectly! He was very professional and we are absolutely contacting him the next time we vacation in Galena!! Which will now probably be sooner than we had planned! 🙂 Thanks again Gerald!! Recently, we threw a bachelorette party in Galena for a good friend. We rented a house for the 14 of us ladies and decided a masseuse would be the perfect thing for Friday night. I found Gerald online and could not have been happier with how the party turned out. Gerald was quick and thorough in his correspondence leading up to the event. He was even able to help us find our rental as we were driving into town. Gerald was prompt and well prepared for us, even bringing comfy socks for everyone! He is extremely friendly and knowledgeable and most of us agreed it was one of the best, if not best, massage we had ever had! I look forward to calling him up for a massage the next time I am in Galena! Thanks! On a recent trip to Galena my mission was rest, relaxation and time to enjoy and appreciate the beauty of God's creation. I was fortunate to have Gerald provide my hot stone massage in the Spa of the hotel where I was staying. Gerald contacted me a few days in advance to coordinate my massage and followed up with me the morning after my massage. Gerald listened to my areas of concern and customized the massage for my needs. The massage was therapeutic to my body and revitalizing to my mind while calming my soul. My muscles felt like "buttah" and I slept peacefully. The next morning I was out for a run and felt reenergized. Thank you Gerald for arranging the massage around my schedule. Knowing I didn't have to get in a cold car after my massage was wonderful! I will whole-heartedly recommend Gerald to my friends traveling to Galena and look forward to my next massage. 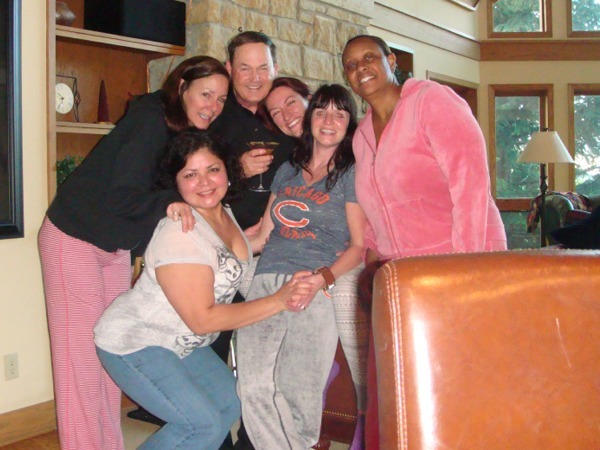 Gerald provided an amazing experience for a recent girl’s weekend trip in Galena March 2014! He provided a customized and unique experience for each of us. We all enjoyed pure relaxation while never leaving the comfort of our weekend getaway home! Thank you Gerald – We’ll look forward to seeing you again soon! My friends and I spend a long weekend every February 2014 in Galena. We look forward to the trip all year, and this year we decided to add massages to our list. I came upon Gerald's website online, and I could tell right away that this would be perfect for us. He came to our rented home and we spent the whole day enjoying the house while Gerald did 6 massages back-to-back. We couldn't have been happier with everything. We were so relaxed, and he is incredibly professional, knowledgable and wonderful at what he does. We will definitely be booking him for our weekend next year. Thank you for making our weekend so memorable! Gerald, a very special thank you for making our stay at the Stoney Creek Inn so wonderful. Our trip to Galena was a relaxing retreat for my mother and I. What a nice surprise when I found your name and business on the internet. I was even more impressed that you took the time out of your busy schedule to come to our motel room. I reviewed all of the kind remarks from other clients. I must say they were absolutely spot on. I appreciate you scheduling us in such short notice. Thank you for making the evening appointment for us both. That gave us the afternoon to explore Galena. We were very impressed with your professionalism and knowledge that you shared regarding your talent. It was quite obvious to us that you truly loved your career and the people that you serve. We have never had such a relaxing massage, ever. Thank you for the time and energy you put into our massages. We had a wonderful nights rest. When we return to Galena for a visit we will be staying at the Stoney Creek Inn and contacting our favorite Healing Touch friend, Gerald. Again thank you for your time. We look forward to your services again very soon! Alisha C. and Deanna E.
I cannot express how much my seven friends and I enjoyed our massages on our Girls Getaway in Galena. Gerald was the most friendly, professional and caring massage therapist. Every girl walked away feeling relaxed and refreshed. The fact that he came directly to our rental home made the experience that much better. A few of the girls were "massage virgins" and Gerald put them at ease and made them completely comfortable. Whether you are having a deep tissue, swedish, or hot stone massage, Gerald is your man!! I only have positive things to say about Gerald and would highly recommend him to anyone interested in an affordable, relaxing, and professional massage!! And an added bonus. . we all received the most warm, comfy, and color coordinated spa socks!!! I have had massage at different spas, resorts and hotels all over the world. Jerry Moore is right at the top of the list of massage therapists. He is very well educated on the latest therapies and techniques. He has an intuitive sense of what your body needs and knows how to get your body to respond to its needs. I have had both hips replaced within the past 4 years. He was able to give me a full body massage less than a month after each surgery and it helped not only with my general pain level, but also eased the tension that the body has when restricted by a surgery of that kind. I have used Jerry many times and he continues to be my first line of defense when some orthopedic issue arises. I can not say enough good things about him as a massage therapist and would recommend him to everyone. Getting a massage by Gerald was the best experience! I enjoyed it very much. Not only did he make me feel completely comfortable, but I felt like butter by the end of the massage. BEST massage I have ever gotten and I have gone to many spas! HIGHLY recommended. Tell a friend! A group of friends travel to Galena yearly, and this year we decided to try something different and get massages. Gerald came over to our rented house and gave 8 of us massages throughout our weekend. It was amazing! ; The convenience of not having to leave the house was wonderful and Gerald made each one of us feel comfortable and thoroughly pampered after the massage session. We had a wide range of people (never had massages before, older/younger) and each person felt like a million bucks after the sessions with Gerald – he knows how to customize his massage and give each person exactly what they want/need. We plan to make this a new yearly tradition we enjoyed it so much! Gerald is friendly, professional, and undoubtedly gives one of the best massages I've ever had! The only bad part of the experience was that it ended too quickly! Definitely book more than 60 minutes – you won't regret it! After receiving massage work from many different spas, styles and skill levels, I am happy to say Jerry is a massage therapist at the top of my list. His philosophy is “client focus,” so he really addresses areas where I need the work. His expertise with pressure, heat and stretch make a Healing Touch massage go First Class. It is fantastic to find a therapist with finesse and experience who travels for my convenience…so my R&R weekends to Galena always include a visit with Jerry. Can you think of anything better than the massage coming to you? Never having to leave my haven near Galena, is just one of the many features that keeps us coming back to Jerry. A custom, therapeutic, thoughtful, and most relaxing experience is what I have always enjoyed about Jerry's massages. Always geared to any physical issues I may have @ the time, every massage is both healing and transformative. In a time where there is too much stress and too little time, I find this to be a perfect escape, where time stands still. Never rushed, Jerry adds his own personal perks to make these massages special! The convenience of having Mr. Moore come to our home for massages is a real treat. This definitely adds to the de-stressing and relaxation that we associate with our Galena home. His professional and comfortable manner make this an easy recommendation. Jerry truly has a “healing touch”. He modifies his massage method to fit what I need at a particular session and even knows what I need without my telling him. The massage technique he uses loosens my tight muscles, relaxes and refreshes me. He skillfully combines warmth and caring with utmost professionalism. I can't thank you enough for taking the time to visit with my mom and I at such an odd time (Saturday evening, beginning at 8:30PM)… The massages were desperately needed and greatly appreciated. A long weekend of shopping topped off with a delightfully relaxing massage was the icing on our cake. Had it not been for your healing hands… I'm not sure we could have finished our weekend. Again, thank you so much for your experience, it was absolutely wonderful. See you again next year !!!! I've been riding and caring for horses almost all my life. I'm one of Jerry's very regular clients because he finds sore muscles and takes my body and mind to a quiet and comfortable place. If you are looking for a professional but convenient massage look no further than Gerald Moore. After a long day at work followed by a 2.5 hour drive to Galena from Chicago, my upper back and shoulders were burning with excruciating muscle pain from tension. We were staying at Bernadine's Stillman Inn where the owner, Dave, highly recommended Gerald. Gerald gave me a fabulous full body massage and really helped my troubled areas. He really cared about my comfort and relaxation. I found Gerald to be warm, friendly, and personable. And his price was very fair – worth every penny! My fiancé and I were engaged that evening! Gerald's massage helped make it the perfect day! I would not consider a visit to the Galena area without first contacting Gerald Moore prior to my arrival to arrange a massage therapy session. Do not pass up an opportunity to take advantage of the benefits of any one of Gerald’s massage therapies. Gerald’s sessions are an extremely good value and you will not be disappointed. Twelve years ago our family began renting homes in Galena. We needed time to reconnect with each other. More importantly we wanted to get to know our grandchildren, spend quality time hiking, playing card games, roasting marshmallows and creating memories. Several years ago, we "found" Jerry… & what a find he is. If you do one thing in your life for yourself, it should be a massage from Jerry. The best part is that he will come to your home; you never have to get out of your robe or dress to drive home! Professional and reasonable. I'm a 42 year old dance teacher trying to keep up with my 15 year old students. "Sore" is my middle name. Jerry's deep tissue massage is the only relief some of my muscles ever feel. He works magic on my tight, overworked calf muscles. I go to Galena just to see Jerry! Having a massage with Gerald was not only an invigorating experience, it was a learning one. I felt so great after the massage, I could walk better, I had less arthritic pain, I felt so wonderful, and it lasted for several days. Gerald also gave me some tips on exercises for my neck pain, and I have been doing them every day for the last several months, and it has helped tremendously. He is very intuitive and asks many questions prior to the start of the massage, and proceeds from there. It was such an enjoyable experience, I am going to book him for a longer massage next time, I was so sad when he told me the time was up! I would highly recommend Gerald, he really knows his craft. My husband and I take an annual trip to Galena for my December birthday. A massage from Jerry is ALWAYS on the itinerary. Jerry has been doing them for us since 2004. He is kind enough to come to the B&B we stay at… massage table, oils, and music in tow – so we don't even have to leave the room! He is the only massage therapist my husband will return to, and my personal favorite (of many trials over the years). We have unique story to share. Prior to meeting Jerry, we had battled infertility issues for three years. Many doctors visits and failed treatments left us frustrated. Today we have two beautiful children, ages 1 and 3, both conceived during the month following our massages. I'm not claiming the he is a fertility specialist, but we definitely believe that the relaxation and tranquility experienced during our professional massages played a role- twice! For that we will forever be grateful! Gerald's healing touch works wonders after a day of skiing or a round of golf. I especially enjoy that he brings the service directly to me so immediately following there is no need to drive or feel any additional stress. Best of all is the extra special foot care! Every time the family visits Galena, the healing touch is out first call! I have now used you several times for massages during our trips to Galena and want to tell you how much I appreciate your excellent work. For a number of years I have received weekly massages from a person in the Chicago Area whom I regarded highly. I have had massages at some of the upscale resorts in such places as Phoenix, AZ (all of which were very mechanical). What I have particularly appreciated is that you not only ask, but listen to what might be a particular ache that day. Further, I was particularly impressed that during the massage you also sense tenseness that was not mentioned. Finally, it is terrific that one has the option of having you come to their home or go to your office. I just wanted to pass on my gratitude and thanks for providing me with one of the best massage experiences I have ever had. Your experience and intuitiveness directed you to the areas on my body that were overstressed and needing the most attention. The result was one of pure relaxation and de-stressing. Our group's yearly trip to Galena will now not be complete without a visit from you and your healing touch – I'm increasing my massage therapy session from 60 to 90 minutes! Healing Touch Massage Therapy Copyright © 2017. All Rights Reserved.